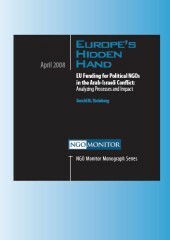 NGO Monitor has published a highly detailed examination of European Union (EU) funding of political NGOs in the Arab-Israeli conflict. The fifty-page report, ‘Europe’s Hidden Hand’, provides the first in depth analysis of this important area, and reveals that between 2005 and 2007, the EU provided tens of millions of Euros from public money to NGOs whose activities directly contradict EU policy. The report also uncovers and analyzes the lack of transparency and accountability in EU funding of NGOs in this region. Click here to read NGO Monitor’s report on the EC’s Partnership for Peace Program. Click here to download the executive summary in English [PDF] or in Hebrew [PDF]. Between 2005 and 2007, the European Union has provided tens of millions Euros from public funds to numerous non-governmental organizations (NGOs), many of which are politically active in the Israeli-Palestinian conflict. In addition to providing services, their reports are perceived as providing expert information to policy makers, journalists and others, and their campaigns have significant political impacts. These activities however, are often inconsistent with the stated objectives of both the NGOs and EU frameworks under which they are funded, including the use of funds ostensibly designated to promote peace for pursuing political objectives which undermine the protection of human rights. This detailed research documents the degree to which EU-funded political NGOs contribute to the conflict and advance particular political agendas. Many of these EU funded groups participated in the NGO Forum of the 2001 Durban conference, and their reports and campaigns repeatedly refer to Israel as a “colonial entity”, and “racist and apartheid state”, while promoting boycotts, divestment and sanctions (BDS). Some EU-funded NGOs also consistently advocate the Arab or Palestinian narrative of the conflict, erase the context of Palestinian terrorism, falsely accusing Israel of “war crimes” and seek to undermine Israel’s Jewish identity. Although EU funding formally goes to projects and not to the NGOs, per se, this distinction is artificial. “Project funding” can be used for general NGO activities and campaigns, travel and publicity to promote the ideologies and interests of officials. EU logos appear regularly on anti-Israel publications issued by these NGOs, providing the image of legitimacy. This report also examines the limited transparency and accountability in EU funding for NGOs. Despite the tens of millions of Euros provided by taxpayers, there is no uniform framework or central database for obtaining information regarding which NGOs the European Commission funds. Moreover, much of this funding information is unavailable or hidden beneath numerous bureaucratic layers. The various EC offices that do provide some information on NGO funding use different systems to display this data, making comparison and analysis particularly difficult. Although some EC offcials cooperated in providing funding information to NGO Monitor, the overall diffculty in obtaining this information reflects the lack of transparency. Other requests for specific funding information went unheeded. In addition, the official guidelines by which the NGOs are selected to receive public funds are very vague, allowing for a high degree of individual preference and bias on the part of EC personnel. These often anonymous officials and outside experts that decide on the allocation of tens of millions of Euros to highly political NGOs are not subject to any external process of accountability. The absence of specific performance indicators to evaluate the impact of EU-funded NGO projects adds to the accountability deficit. These conclusions are illustrated in detailed analysis of EU funding frameworks and processes, including EIDHR, PfP, and ECHO. Case studies of recipients — Adalah, the Euro-Mediterranean Human Rights Network (EMHRN), the Israeli Committee Against House Demolitions (ICAHD), the Applied Research Institute-Jerusalem (ARIJ) and Christian Aid — explore the divergence between their activities and official EU guidelines. The report concludes with recommendations on steps to improve the transparency and accountability of European Union funding for NGOs. These include creating a searchable database of NGO recipients with a standard format for viewing detailed funding information. We also recommend measures to evaluate biases and external factors which effect decision-making on NGO funding requests. The need for transparency in NGO funding is particularly salient in the context of the preparations for the “Durban follow-up” conference scheduled by the United Nations for 2009. To avoid a repetition of the disastrous 2001 experience, particularly in the NGO Forum, the EC should adopt and implement clear guidelines precluding EU funded NGOs from participating in activities that promote conflict, including calls for the destruction of a state or its national identity; support for divestment, boycotts and sanctions against Israel; advocacy of a “one state solution”, meaning the destruction of Israel, and other rhetoric which inflames hostilities.